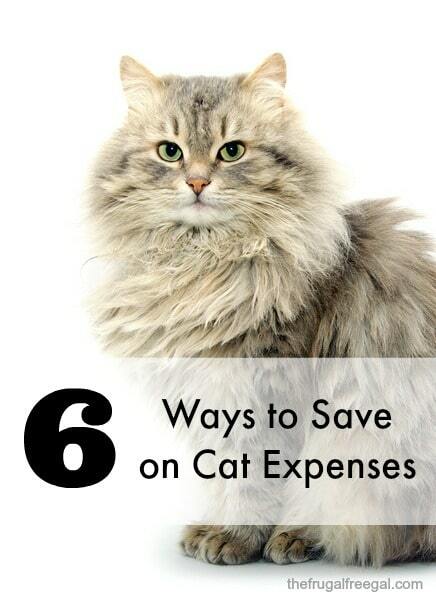 Are you looking for ways to save on cat expenses? While cats may not seem like terribly expensive pets to have, the costs can add up quickly if you aren’t careful. In addition to following the typical money-saving advice such as shopping around and using coupons, here are six more ways to save on cats that you may not have fully considered yet. Try them today–who knows who much you could save! Keeping your cat clean and beautiful doesn’t have to require expensive trips to the groomers. Many basic cat grooming tasks can be done at home to save you money. These routine grooming tasks include brushing your cat’s teeth, cleaning her ears, bathing her, brushing her and trimming her nails. Here are a few cat grooming supplies that may help. If you are uncertain about how to do these things at home, ask your vet or watch carefully the next time you take your cat in to the groomer. You may pick up some valuable tips or methods. While you will undoubtedly want to buy your cat a few toys, that doesn’t mean you have to go overboard. Instead of picking up a new toy every time you are out or for every special occasion, stick to a few classic toys your pet is sure to love and use time and time again. Make sure you purchase quality toys as well, so they will last a while. Have you signed up for your local pet store’s newsletter or the newsletter of your favorite cat products companies? Some companies routinely mail or email coupons, special offers and information about upcoming promotions. Not only is signing up for these newsletters a good way to keep up-to-date on the latest products you likely want to know about as a cat owner, but it can be a great way to save big as well. When you feed your cat, do you pay attention to how much you are serving or do you just quickly toss some food in his bowl? If you routinely offer your cat more food than he really needs, you are wasting money in two ways. First, you are spending more money on cat food than you need to, and secondly, you may be setting yourself up for big medical bills down the road if your cat becomes too overweight. Just because your cat food comes in handy serving sized tins does not mean that that’s the amount your cat needs. Figure out what your particular cat needs in order to be healthy and feed him that amount instead. Find the perfect cat food for your cat. While some cats love to be outdoors, the truth is that letting your cat wander around as she pleases exposes her to several new dangers–and expenses. For example, your cat could get lost, which means you would have to spend time and money to find her. She may get a parasite or infection or eat something that makes her ill, which means that you would need to spend time and money at the vet. The safest and most frugal place for a cat is indoors. Consider a cat tree for your cat! Lastly, if you have some spare time on your hands, you may consider getting a part-time job at a pet store. Pet store employees often get great discounts, which can significantly reduce the amount of money you spend on your pet. Plus, you may be able to get certain deals, freebies or other perks just for being an employee. Even if you only have a few spare hours a week, it may be worth your time to inquire if your local pet store is hiring. Are you a cat owner? How do you keep your cat expenses affordable?